Markets remained volatile in the second quarter of 2018, as a series of political and geopolitical events caused temporary pullbacks in stocks. But in contrast to the first quarter, U.S. economic growth and corporate earnings reminded investors of still-strong economic and market fundamentals. Subsequently, the major U.S. stock indexes were able to finish the quarter with modest gains. Through the first half of 2018, one of the keys to analyzing the markets and the economy has been the ability to separate potentially worrisome political and geopolitical headlines from still-improving corporate and economic fundamentals. Put more plainly, cutting through the “headline noise” has been essential to assessing the outlook for various assets. To that point, during the second quarter, investors have had to weather market volatility caused by numerous unsettling headlines, including the imposition of steel and aluminum tariffs on U.S. allies, threats of a significant trade conflict between the U.S. and China, an Italian and EU political scare, and lack of progress on Brexit. We also saw a material rebound in U.S. economic data from the first quarter, with Q1 earnings reports (released in April) reinforcing positive annual earnings growth for the S&P 500. The underlying fundamentals of the economy and the stock market steadily improved, despite the aforementioned headline focus on trade and politics. So, while the media’s attention was on trade and political dramas, economic data and earnings were very important positives that helped to support the U.S. stock indices and ultimately led to the positive quarterly performance. Meanwhile, away from political and trade dramas, the Federal Reserve raised interest rates another 25 basis points in June (as expected) and signaled it intends to raise rates two more times in 2018, which should bring the Fed Funds rate to nine-year highs. And, those rate hikes came in response to steadily rising inflation, which this past quarter finally hit the Fed’s 2.0% year-over-year target. Steadily rising inflation and interest rates remain an important investment theme to consider, and of which to be aware, as it presents a different environment than what we have experienced over the past decade since the financial crisis. In sum, the second quarter again served as a reminder that the historically low volatility of 2017 was an anomaly. Yet as unwelcome as the return of volatility has been in 2018, it remains well within historical norms. And, while volatility will likely continue into this current quarter, focusing on market and economic fundamentals in the context of an investor’s long-term strategy and goals will continue to be a recipe for success in this challenging market. In a testament to the idea that economic and corporate fundamentals matter, the rebound in U.S. economic activity was the driver of second-quarter stock market performance. Small caps and tech (represented by the Russell 2000 and NASDAQ Composite) both outperformed the more large-cap weighted S&P 500, while the Dow Industrials relatively lagged thanks partially to trade concerns (the Dow is populated by many multinational companies which could be negatively impacted by tariffs). On a sector level, similar themes were apparent. Energy was the best performing S&P 500 sector in the second quarter, aided by the late-June surge in oil prices. But, consumer discretionary and tech sector performance also was strong, as those sectors keyed off rising consumer spending and a rebound in economic data. Meanwhile, despite the uptick in market volatility, defensive sectors lagged, with utilities and consumer staples largely tracking the broad market. Finally, financials underperformed in the second quarter, as a pullback in Treasury bond yields and a flattening yield curve pressured the sector, although banks resiliently bucked the trend thanks to continued deregulation. Overall, major index and sector performance reinforced the notion that while headline volatility made for a bumpy ride in the second quarter, markets focused on improving economic growth and still-strong corporate fundamentals. Looking internationally, the second quarter was not kind to markets overseas. Foreign developed markets relatively outperformed emerging markets, which had a very poor quarter. But in aggregate, foreign stock markets badly lagged U.S. markets in the second quarter, and that was largely appropriate given relative economic fundamentals. Foreign developed markets (the EU, Great Britain, Japan, etc.) 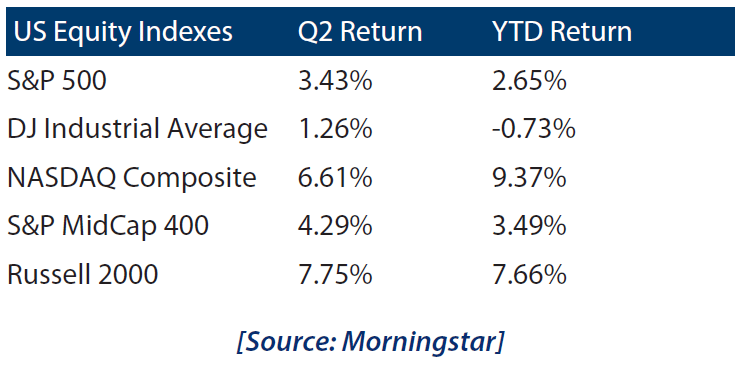 saw an extension of the loss of positive economic momentum that occurred in the first quarter of 2018, and that was a headwind on returns. Emerging markets (China, South Korea, Brazil, Argentina, Turkey, etc.) 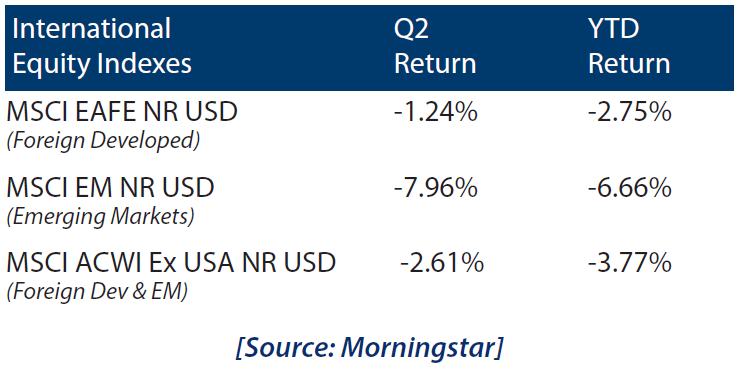 were decidedly negative in the second quarter due to multiple reasons, including political unrest in Turkey, a fiscal crisis in Argentina, and, late in June, a sharp drop in the Chinese stock market due to concerns about U.S. and Chinese trade conflicts. Turning to commodities, most major commodities indices were positive in the second quarter, aided by a big rally in the energy complex. Oil surged higher in the second quarter, reaching a multi-year high thanks to a late-June rally. Strong global economic growth (which points to continued demand), combined with a smaller-than-feared production increase by OPEC, led to a spike higher in oil to end the month. Gold underperformed, however, with prices falling to the lowest level since December in the second quarter as persistent dollar strength pressured the yellow metal. Switching to fixed income, the leading benchmark for bonds (Bloomberg Barclays US Aggregate Bond Index) declined for a second straight quarter. 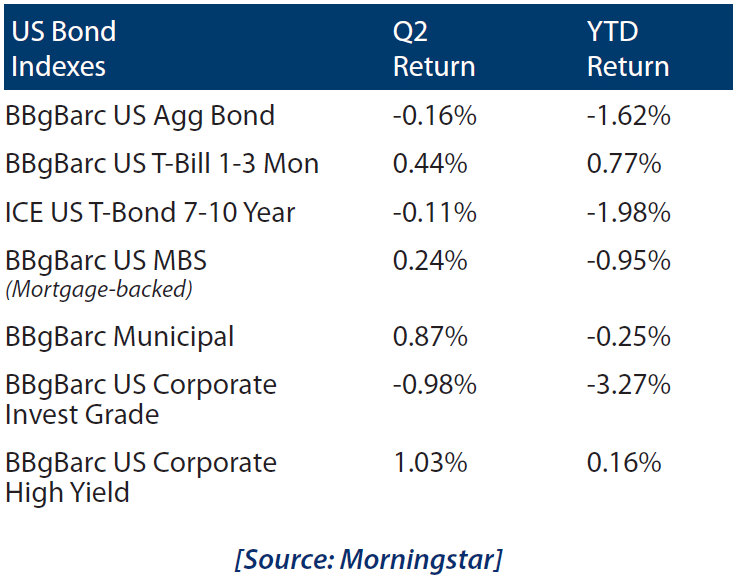 This is the first time in over four years that the leading benchmark for bonds has registered consecutive negative quarters, as concerns about rising inflation and rising interest rates pressured fixed income markets. There was a clear preference by investors for shorter duration bonds, as one- to three-month Treasury bills again logged a positive return. That makes sense, given the expectation of two more Fed rate hikes in 2018. However, like the stock market, bond market investors also looked past the trade-related headlines and focused on solid economic growth as high yield bonds bounced back from a decline in the first quarter and turned positive year to date—a sign that bond investors are not overly concerned about an imminent economic slowdown. Looking forward, we expect heightened volatility to persist in the third quarter, and likely for the remainder of 2018. Uncertainties such as trade war worries, rising interest rates and accelerating inflation, combined with looming midterm elections, should keep volatility elevated, especially compared to 2017. But, while we expect and are prepared for continued volatility, the second quarter was a good reminder that investing for the long term requires careful deliberation of market-related headlines (not knee-jerk reactions) and continued focus on the critical factors that ultimately determine economic expansions vs. recessions, and rising vs. falling stock, bond and commodity markets. To that point, while they do not receive a lot of media coverage, there are multiple, important positive factors underpinning the stock market and the U.S. economy, including: Robust economic growth, rising corporate earnings, solid consumer spending and a very strong labor market. As long as these positive fundamentals remain in place, headline-induced volatility, whether trade- or politically- inspired, will likely continue to be a temporary headwind on stocks, but not something that will end this near-decade-long economic recovery. At Krilogy Financial, we understand that volatility, especially policy-induced volatility, can be unnerving and upsetting, even if it is historically typical. That’s why we remain committed to helping you navigate this changing geopolitical and market environment, with a focused eye on insuring we continue to make progress on achieving your long-term investment goals. Our years of experience in all types of markets, both calm and volatile, have taught us that successful investing is a marathon, not a sprint. Shifting political policies, temporary corrections, volatility, and short-term events are unlikely to alter a diversified approach set up to meet your long-term investment goals. Therefore, it remains critical for investors to stay invested, remain patient, and stick to a plan. That’s why we’ve worked diligently with you to establish a personal allocation target based on your financial position, risk tolerance, and investment time horizon.